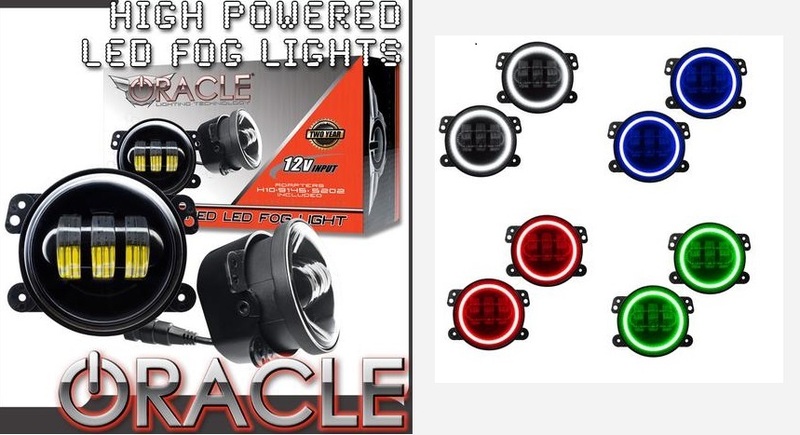 ORACLE Hi Power Plasma Fog Lights 2007-15 Jeep Wrangler [Oracle 5775-051-4 SMD Fog Lights] - $439.95 : 3rd Strike Performance, Your Source for Late Model MOPAR Performance Parts and Accessories! Finally a complete High-Powered LED Fog Light Housing replacement for Late Model Jeep, Chrysler and Dodge vehicle applications. This direct-fit fog light features plug-and-play wiring for easy installation. These amazing LED units push out approximately 3000 raw lumens which is guaranteed to light up the night on road or off road! These rugged design can operate in the worst possible conditions. Each light utilizes a rugged Polycarbonate lamp housing to withstand impact and a Solid-State luminaire design for vibration resistance. The epoxy-sealed electronics avoid moisture and corrosion. Perfect for the off-road adventurer who wants to cover new ground on the trail that never ends. *Please allow 5-7 business days for order processing. As these headlights are built to order.